← Y’all it’s been one of those days. A few posts ago, I talked about how I had been quite slack on my reading lately. I also shared that I was working on it. One day while scrolling through Pinterest, I saw a link to a blog where the reader shared each month the books that she had read and her opinion on them. I thought that might be a fabulous way for me to hold myself accountable. I mean, who would want to write or share a post with only one book?? So, my goal is to have at least two books per month completed. This past month I was able to cover more because we went on that wonderful relaxing getaway where I lounged by the pool and read every day! 😃 So even though this is my first post with this topic, don’t think that this many books will be included each month! The first book I read was Live Original by Sadie Robertson. This is Allie’s book. She received it as a gift and had already read it. She told me that it was really good and she wanted me to read it myself. It is written by a teenager for tweens and teens, so it’s pretty easy reading. It has a great message for young girls!! The second book was Life is______ by Judah Smith. My husband is a huge fan. He has met Judah Smith, cherishes that selfie, heard him speak and read his books. I heard him last year at the Hillsong Conference. The book was really great. I really like his style. It had really great points in it, but it was also easy to read. It flowed really well and I am already looking forward to reading another book by him. I also read Undaunted by Christine Caine. This book taught me a lot about her back story– things that I had no idea about. The timing was perfect for me to read this book as it reminded me that God can make a way where things seem impossible. Her testimony served as an excellent example of how if God calls you to do something, it will work out no matter how much things may seem to be stacked against you. The fourth book I read was The 4:8 principle by Tommy Newberry. This book is one that I’ve had for years and have just never read it. It is based on Philippians 4:8. It’s all about thinking positive and training your mind to think this way. This was not my favorite book. I made myself finish it, just because I’d had it so long and had already started it. It is written like the author is teaching you- he refers to himself as the coach all throughout the book. I know there are tons of people out there that love this book, it just wasn’t my cup of tea. I do however totally appreciate the content. I believe and have been told that is the way I think naturally. So, being a person that already tends to lean on the positive side of things….the book was a little repetitive. The last book I read was The Fringe Hours by Jessica Turner. This book wrecked me . It had such an impact on me that I almost immediately knew that I wanted to pass it on to someone else and I already have. It spoke to me as a wife and a mom that is juggling a lot. I also tend to put a lot of pressure on myself and this book addressed that in the most real way. 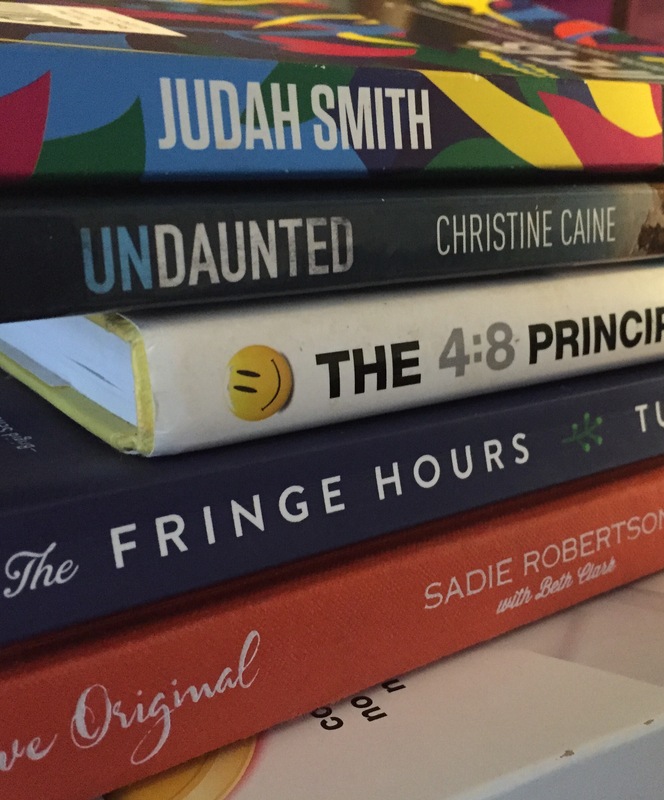 All of these books truly blessed me…. Some more than others. None of them were a waste of my time. I’m not sure if anyone will even read this. If so, maybe you are looking for your next book to read. Who knows …..maybe you will pick up one of these…. Hello to anyone taking time form their busy lives to read my blog. I am a wife to an amazing man, who I am blessed to serve alongside in youth ministry. I am mommy to two amazing kids who I am privileged to be able to homeschool. This blog is out of my comfort zone and certainly me trying to be obedient to Christ. I love Him more than I care about my own comfort or awkwardness. Hopefully, this blog is honest, real, and transparent. I'm not a big fan of fake. The Lord is using it to bring growth to me...and I pray that in the process something about my crazy beautiful life might also encourage others.